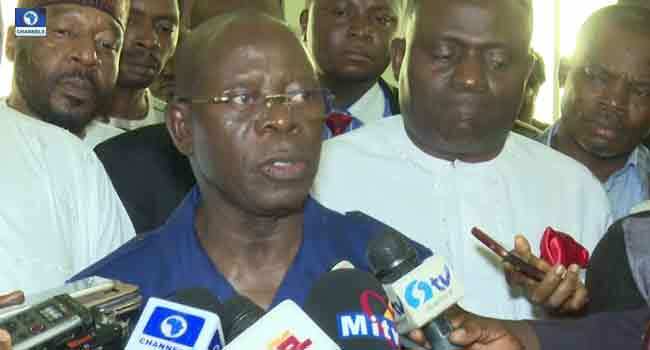 The National Chairman of the All Progressives Congress (APC), Adams Oshiomhole, has said that he will not lose sleep over the defections currently hitting the party. He stated that he is not worried about disgruntled members leaving the party, but noted that “water will eventually find its level”. The National Chairman disclosed this on Tuesday after a meeting with President Muhammadu Buhari at the Presidential Villa in Abuja, the nation’s capital. His comments come after 15 Senators defected from the APC to the Peoples Democratic Party (PDP). The Senate President, Bukola Saraki, made the announcement during plenary on Tuesday. The defecting Senators are Senator Dino Melaye, former Governor of Kano, Rabiu Kwankwaso, Barnabas Gemade(Benue), Shaaba Lafiaji(Kwara), Rafiu Ibrahim(Kwara), Abdulazeez Nyako(Adamawa), Monsurat Sunmonu(Oyo) and Usman Nafada(Gombe). Senators Suleiman Hunkuyi, Ibrahim Danbaba, Ubale Shittu, Isah Misau, Suleiman Nazif, Soji Akanbi. While at the House of Representatives, 37 lawmakers also defected from the ruling All Progressives Congress (APC). 33 lawmakers defected to the opposition, Peoples Democratic Party (PDP) while four joined the African Democratic Congress (ADC). Some of the defecting lawmakers are Danburam Nuhu, Mark Gbilah, Razak Atunwa, Ahmed Garba Bichi, Abdulsamad Dasuk and Zakari Mohammed, Sani Rano, Barry Mpigi, Ali madaki, Dickson Tackighir, Hassan Saleh. A total of 51 members have left the APC today.